I just picked up my copy of Final Sentence yesterday. I have been waiting for this for quite a while. The author Daryl Wood Gerber also writes the Cheese Shop mysteries under the name of Avery Aames. I really enjoy the Cheese Shop series and believe it is one of the better written cozy mystery series. 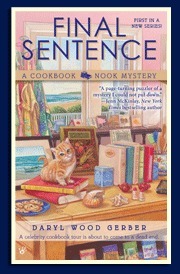 This new series, A Cookbook Nook Mystery, does not disappoint. The character of Jenna Hart is well written and believable. She is a widow still dealing with the grief of losing both her husband and her mother. She returns home to run a new business with her Aunt Vera. The other characters are interesting with a fair share of the quirky variety thrown into the mix, her Aunt Vera, Pepper and Rhett to name a few. The mystery is well done. I was not sure “whodunnit” until the reveal, many of the characters displayed suspicious behavior leaving the reader wondering. Being the first in a series, there was quite a bit of establishing the setting, the recurring characters, and some of the back story, but it did not interfere with the flow of the story. Additionally, there was device used that I have seen recently in two other books, “dropping” the names of authors and books throughout the text. For some reason, I found this very disruptive when I read Death on Demand and A Killer Read, but I did not in this book. Perhaps I am getting more used to it, being this is the third one I’ve read using this device ? Or maybe it is because it is so clearly incorporated into the plot here, Jenna is selling cookbooks and she is learning to cook? It did not feel like just gratuitous name dropping; it felt as though it was a natural part of the dialogue and plot. Maybe it is just that I collect cookbooks and so knew almost all the titles mentioned and didn’t feel the need to stop and look them up? Whatever the reason, I feel that it worked in Final Sentence. The other point that I really liked was that there were some loose threads that I’m sure will be picked up in subsequent books. What is the real story behind Jenna’s husband? Was he good guy or up to something? What was the whole story between Aunt Vera and her fiance? These open questions will be part of what keeps me going with the series. Great series opener! Can’t wait for the next one. I really like this author’s writing style.